Boxing continues expanding rapidly in Vietnam and Sunday's exciting fight card in Ho Chi Minh City (formerly Saigon) vouches for that. In the evening's main event Uzbekistan super welterweight Khusniddin Pulatov (7-3, 4 KO's) nailed a unanimous decision victory over more experienced Filipino warrior Rodel Wenceslao (13-17-2, 5KO's) to defend for the first time his WBA Asia Super Welterweight Title Sunday evening (Jan 20) in Ho Chi Minh, Vietnam. The taller, more aggressive Pulatov, 27, who weighed in at 69.6 kilos, proved to be the superior fighter throughout the 12-round combat that entertained the fans in attendance at the city's District 7 Arena. Official scores were 118-110 and 119-111 (twice) all in favor of the Uzbekistan warrior. The third man in the ring was Byung-Moo Kim and the supervisor for the WBA was Won Kim of Korea. 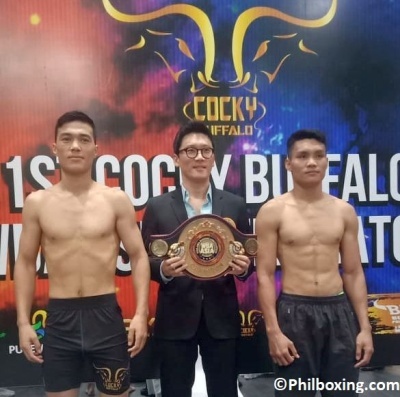 During weigh-in, Khusniddin Pulatov (L) poses with supervisor Won Kim and Filipino opponent Rodel Wenceslao. In the co-main feature, 23 year-old Russian super lightweight Mikhail Lesnikov (3-2, 1 KO) came out from his red corner swinging wild to roughly punish unheralded Indonesian Afrizal Tamboresi (11-10, 6 KO's), dismantling him half-way through the very first chapter. Official time was 1:17 in round one. It was Lesnikok's first scalping outside of his native Russia, and he wants more. In more action, hard-hitting Abdurasul Ismoilov (4-1, 4 KO's) of Uzbekistan scored his fourth consecutive stoppage win by flattening 41 year-old Filipino journeyman Jaime Barcelona (41-64-1, 10 KO's) in the seventh round. Time was 1:46. The 22 year-old Ismoilov -- who Saturday weighed-in at 61.2 kilos -- feels now ready tougher challenges. Also, after a 2-year hiatus Vietnamese super lightweight Van Chung Nguyen (2-0, 1 KO) comes back the ring to score a unanimous decision win over young 18 year-old warrior Joon Kyoo Oh (2-2, 1 KO) of Korea. Some ring rust was evident on Nguyen, however, the victory motivates the 23 year-old to ready himself for more exciting action. 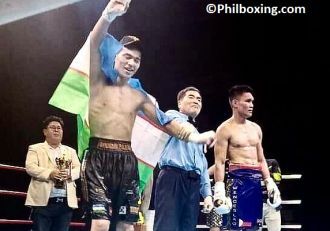 In addition, super bantamweight Ravshanbek Shermatov (3-0, 1 KO) of Andijan, Uzbekistan, outclassed Indonesian warrior Wado Sabu (13-14, 3 KO's) in their 6-round thriller. Scorecards were unanimous for Shermatov who Saturday weighed-in at 55.2 kilos. In a lightweight rumble, Vietnamese Dinh Hong Quan (2-0-1, 1 KO) decisioned 23 year-old Korean Suk Joon Hwang (3-3-3, 0 KO's). Tallies were unanimous for Quan who fought for the first time as a pro in his native Vietman. His previous battles were in South Korea. In the evening's opening bout, local 108-pounder fighter Sam Minh Phat (1-2, 1 KO) ravaged 29 year-old Indonesian Sulis Barrera (2-5, 0 KO's) to claim his first win in pro boxing. Official time was 2:58 of round 2. The entertaining evening of boxing in Ho Chi Minh City, Vietman, was the first production of promoter Sang Bum Kim of Cocky Buffalo Promotions.